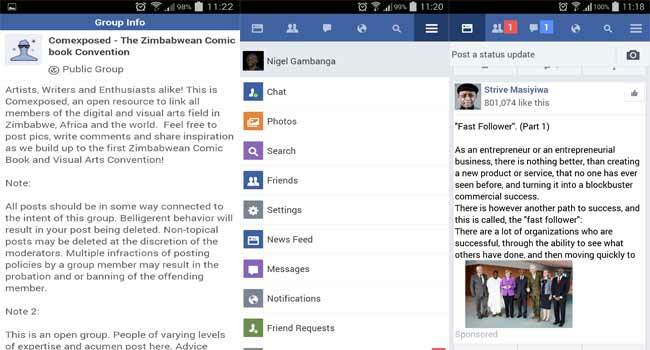 Home » Gadgets & Apps » Facebook Lite launched, will we use it because of expensive bundles? Some of you might remember how earlier this year, Zimbabwe was one of 8 countries that got to pilot Facebook Lite. This version of Facebook is data efficient and was designed to allow users of the internet in emerging markets to access the social network at a fraction of the cost. Fast forward to June 2015, and Facebook Lite has been officially launched. Yesterday, Facebook announced a rollout of the app that will start in Asia and then moving on to parts of Africa, Latin America and Europe in the next coming weeks. No other changes seem to have been made, so it’s still available on Android only, something that made sense then and still does now because of the mobile operating system’s dominance in emerging markets. Does this change anything for us in Zimbabwe? Facebook Lite has been in the Play Store since January, so if you want to get your Facebook experience from a lighter, faster but stripped done version of Facebook you can just jump in. The only change in the market is of course, the adjustment of Facebook bundles from the provider of mobile broadband with the largest subscriber base, Econet. I haven’t used Facebook Lite yet, so I’m not sure how much data on Facebook one gets to save when they try it. I stayed away from it because the stripped down, Facebook experience on Lite didn’t seem rich enough. But I was speaking from a position of Facebook Bundles arrogance. With an extra $3 that I now have to part with for more Facebook video access, I just might find myself on that Lite tip.